Indeed, PRECYPLAN 365 takes care of the rest by adapting the schedule to the 12 months of the year, starting with the month of your choice, both in terms of content and formatting. A free Excel application to create a work schedule for your teams. The software allows to generate simply and especially quickly and without possible error a monthly planning from the information provided (time codes, work cycles...). The author also distributes a professional version of his software with management of absences and replacements and management of hours worked by your collaborators. For Excel and compatible spreadsheets, this free job search tracking table will allow you to track the sending, responses and reminders for all your contact procedures with a potential future employer. 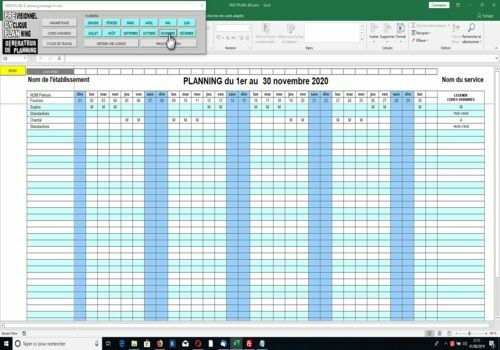 If you are responsible for your team's planning, this Excel® application will help you on a daily basis and save you a lot of time. Don't be caught off guard when a recruiter calls you. This utility easily records and finds the content of announcements, cover letters, resumes and any remarks or comments.